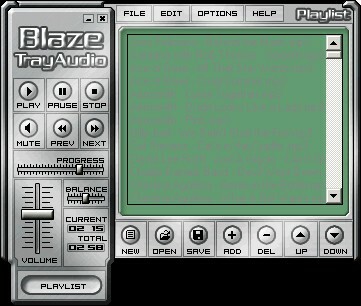 Blaze TrayAudio 3.0 free download. Blaze TrayAudio is a little yet strong media player for playing all of your favorite multimedia files. Blaze TrayAudio is a little yet strong media player for playing all of your favorite multimedia files. Trimmed down so it saves on valuable system resources, The software has many advanced features for listening to music while you work or play! Convenient and powerful graphics and multimedia "add-on" for Windows Explorer that saves time and increases productivity by allowing you to preview image, animation, video, and audio files without having to open a separate application or even leave your workspace. WebEQ XP is a real-time 10 band graphic equalizer for your computer that will optimize your system's sound system so that your computer's audio can achieve only the highest quality sound. Playa!TraX allows convenient control of your media through almost any input device -- including voice control, gamepads, joysticks, racing wheels, foot pedals or even just key board and mouse, the choice is yours. Wave Creator will bring you full audio editing and transformation capabilities with a clear, simple, easy-to-use interface. Wave Breaker will take an audio file, detect silent places in the file and break the file into smaller files at those silent places. Blaze MediaConvert is a powerful multimedia batch converter supporting conversion among over 70 image, audio, animation and video formats quickly and easily.